Could extraterrestrial intelligence be relatively nearby? With that possibility in mind, the Allen Telescope Array has been used to observe planets around the star Trappist 1 – a target that is a mere 40 light-years distant. Trappist 1 system. Credit: ESO/M. Kornmesser. In general, SETI has preferentially swung its antennas in the directions of star systems with known planets, preferably of the potentially habitable variety. Many of these candidate systems were discovered using NASA’s Kepler Space Telescope. The detailed working of that instrument mandate that the discovered exoplanets are at quite large distances, typically between 500 and 1500 light-years. The consequences of this limitation can be demonstrated in the case of Kepler object KIC 8462852, also known as “Tabby’s Star”. This stellar system is in the news because of the provocative speculation that it might be the site of a megastructure constructed by advanced extraterrestrials, perhaps an ensemble of solar panels for collecting energy. 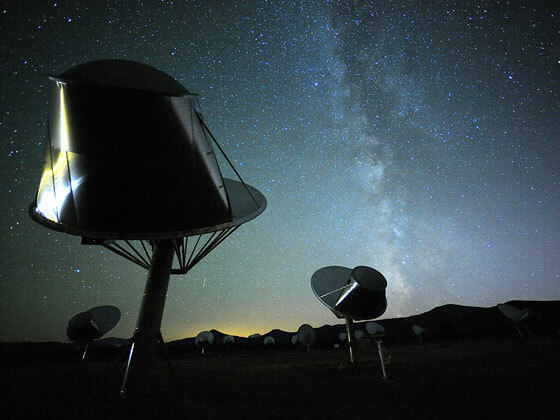 This widespread interest prompted scientists at the SETI Institute to use the Allen Telescope Array to search for radio transmissions coming from its direction. None were found, but because of the considerable distance to this object (1470 light-years), it is impossible to rule out the existence of reasonably powerful transmissions that were – at this remove – simply too weak to be detected. By contrast, Trappist 1, which was discovered by a group of exoplanet researchers led from the University of Liege in Belgium, is in our cosmic backyard. It offers a more-than-thousand-fold improvement in sensitivity to any transmissions. The three detected planets around this dim, red dwarf are roughly the same size as the Earth, with orbital periods of a few days to possibly as much as 2-1/2 months. They are, quite obviously, in very tight orbits. 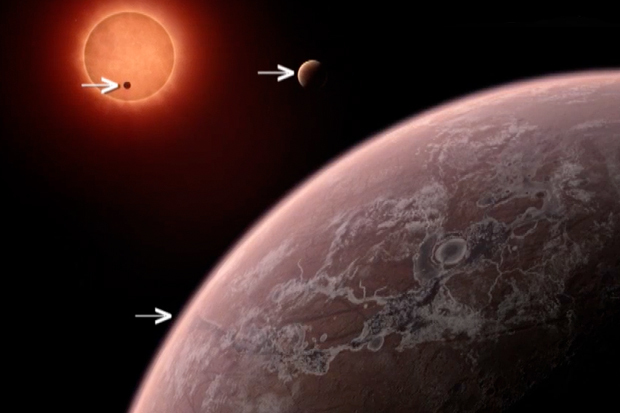 But because their host star is so dim, all three could be “habitable” in the sense of (1) being rocky worlds like Earth or Mars, and (2) sporting temperatures that would permit liquid water oceans and an atmosphere. A further, more speculative consideration is that any stellar system with more than one habitable planet could host a civilization for which interplanetary communication links would be important – a possible source of detectable signals. The Allen Telescope Array is uniquely capable of observing targets of opportunity, so for two days in early May it searched for narrow-band radio signals (~1 Hz or less) coming from the direction of Trappist 1. The radio spectrum between 1 and 10 GHz was examined, and no signals above 3 10-24 watts/m2-Hz were found. The import of that upper limit to signal strength can be demonstrated with an example. If Trappist 1 has inhabitants sending a signal in our direction with an antenna 300 m in size (the same as the Arecibo telescope in Puerto Rico), then our observations would be able to find it if the transmitter had a power of 300 kilowatts or more. That is hardly an implausible power level.